You may assume that I am referring to the Vermont parish repertoires here. I am rather thinking about Peter Parish, who lived in Ferrisburgh in the mid 1850s until the early 1880s. He was one of my famous brick walls. When I found this French Canadian, son of John and Mary—insert a big sigh—, I couldn’t figure out what his surname was in Québec. And I remember conceding that I would never know who his parents were. Well, I am very proud of the hard work I have done on this one—you may read the whole story here. Last Saturday, I was looking at the Clarence Wells Tourville genealogy book which he had prepared for his close family members in the late 1980’s. I was lucky enough to receive a copy last month from one of Mr. Tourville’s relative. I cannot tell you how generous I think it was from her for doing so [Thank You Joan! #happydance]. Well, I almost fell off my chair when I read in that book that Charles Tourville (1802-?) and Sophie Arpajou (1811-?) 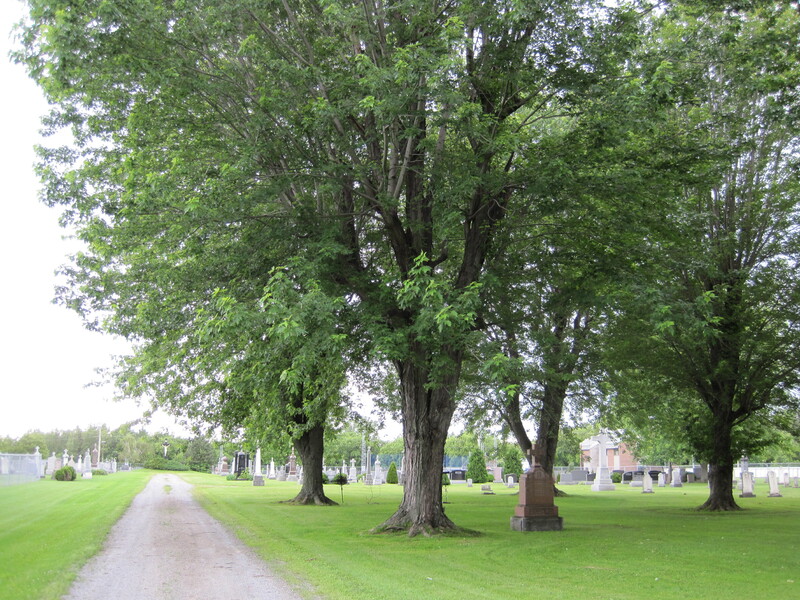 were supposedly buried in their son Stephen Tourville’s cemetery plot which is in Section 2, Lot 22 in St. Patrick’s Cemetery, Chateaugay, Franklin County, NY. No source or reference were indicated for that information. I was often told that Charles and Sophie were probably buried there but no one has ever specified to me that there was a listing of the cemetery plot in the Clarence Wells Tourville book. † Charlie DeTourville, born in 1802 (I believe, it is written next to his name, there is no notation on what the date means) no date when he was buried, but he is buried in the lot otherwise his name wouldn’t be there. “I can’t find any record of her in our books, but it says she was buried in St. Patrick’s, and it even has a picture of her stone. Some books were destroyed in a fire years ago, so she might have been in one of those. She should be in the books that I have here, but she is not. I answered back as I wanted to confirm that I understood it right, that Charles and Sophie were indeed in Section 2, Lot 22. The two children mentioned in the Clarence book may be in fact Peter’s grandchildren as James and Elizabeth were his daughters’ children. As for “Estele” which has not been found by the secretary I thought that she might be Marie-Édesse who was still living in 1840 and died before 1850. The Cemetery opened in 1844 but the fact that Sophie and Charles are both buried in Chateaugay probably means that they went to live in Chateaugay before Sophie’s death which probably occurred between 1848 (she had twins that year in Vermont) and 1850. As for Charles, he died between 1850 and 1860. I have updated Find A Grave to include Charles and Sophie‘s burials in St. Patrick’s Cemetery. A trip to Chateaugay is planned for this Spring for sure! All researchers who have helped me over the years know my obsession for Charles Tourville and Sophie Arpajou. Well, Charles and Sophie can now rest in peace… and so can I! I will of course continue to look for the date of Charles’ death but I am so happy I finally know their final resting place! After reading the inventory of estate performed on October 20, 1851 in St-Hughes, Québec, after the death of Sophie Arpajou, I can’t help imagine what led to it. Maybe Sophie’s husband, Charles Tourville, who was then living in Chateaugay, New York, called for a family council, wondering what to do with the land that he still owned in St-Hughes. With his two older children of age, Charles Jr and Sophia, both married and living for three years then in Vermont, they were probably not interested to start all over again in Québec or maybe the land was so poor, it was no use even trying to. So on September 25, he went to Ferrisburgh, in Vermont, to get from his son Charles the procuration he needed to sell the land. Two days later he stopped at his daughter’s house in Vergennes, to get the procuration from her as well. So in the fall of 1851, Charles Tourville made the trip to St-Hughes, maybe for the last time. He probably stayed with his brother-in-law, Joseph Langevin and his wife Madeleine Arpajou, sister of Sophie, in nearby St-Barnabé, where Joseph and Madeleine had a farm. So what to do? Sell the land? To do that, Charles had to go before a judge and get a tutorship act. He first made a request to the judge on September 25, with the help of notary Timothée Brodeur. So, on October 10, before Circuit Court Judge Jean Casimir Bruneau in Montreal, the elected tutors for the six minor children were Charles Tourville as tutor and Joseph Langevin, maternal uncle to the children as surrogate tutor. The most precious, valuable information coming from this inventory is the list of the minor children of Charles and Sophie Arpajou and their age as of October 20, 1851. Please note that this list appears in three different documents, all produced in the fall of 1851 and all the information is consistent from one document to another. Followed the inventory estate performed by Me Timothée Brodeur and Me Joseph Amiot, public notaries and Jacques Gendron and Lucien Houle as appraisers, both from St-Hughes. The inventory estate can be found here (in French) as well as the transcription here (in French). Besides the land, Charles’ possessions didn’t amount to much. A mare, a two-handed saw, a board saw and 8 pounds and 12 sols in cash. On one hand, nobody owed him money but on the other hand he owed about 459 pounds to J. A. Arpajou for seignorial arrears and 36 pounds to the notary for the inventory itself. As for the papers of the family, two documents are mentioned: the marriage contract of Charles and Sophie Arpajou that was passed on August 31, 1827 (day of the religious marriage) before Me Charles Bazin, act number 373 as well as the tutorship act dated October 10, 1851. The land he possessed was on the “fief” Beachemin, north of Yamaska River, in the county of Richelieu, of 2 arpents large by 30 arpents long before the Yamaska River, besides the properties of Bazile Richard on one side and of François Lussier on the other side. It was boarded by the “rang” Barrow at the other far end. An inventory of estate was usually done after the death of the spouse when there were surviving minor children. It was usually done before the widow/widower remarried to protect the inheritance of the children. Of course, people with no property nor money had no interest of doing so. Before I start to tell the story about the children of Charles Tourville and Sophie Arpajou in the weeks to come, I thought it would be a good idea to start at the beginning and let you know where the children were living after the death of their mother in 1850. Was Charles’ family living in Vermont before the death of his wife Sophie? Had she die in Ferrisburgh or Vergennes? We know for a fact that she had twin babies in 1848, both of them being baptized in St. Mary’s Church, in Burlington (there were no resident priest in Vergennes at that time). Now let’s see. Charles Jr married Julia LeClair probably in Ferrisburgh about 1847. He was living there in 1850 with his wife and their first-born, 2 year-old Henry. Also living with them is Charles’ younger sister Philomena (listed as Meranda), 8 years old. Sophia Tourville married Joseph Giguère in Ferrisburgh in 1848. They were still living there in 1850 with their two children, Mary and Edward. Note how the name Giguère was mispelled! So, I think it is very much likely that Charles, after the death of his wife Sophie, may have chosen to live with his sister Catherine. I have found three children living in Vermont. The youngest children, i.e. Edith, Julia, Louis and Joseph are living with their father in Chateaugay, New York. 1850 US Census for the town of Chateaugay, in the County of Franklin, State of New York, taken the 2nd of August 1850. Only Peter Stephen, age 15, could not be found. I strongly believe that he was living in Vermont as well. As he was older, he was probably working and maybe living as a boarder with other people and was not enumerated. The Census enumerator didn’t always take the information directly from family members. They often enquired with neighbors, so the mispelling of names, the errors in age were common practice.